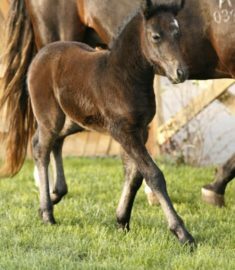 Rainbow Too, the cloned foal of legendary pony Rainbow Connection, was foaled in 2009. Shown in the early ‘90s by Eric J. Daly, Rainbow Connection was not only National Green Small Pony Hunter Champion, but also champion at many of the East Coast’s biggest horse shows including Florida and Devon in 1992. In 1994, 5-year-old Evan Coluccio took over the irons and it seemed that he and Rainbow Connection were an unbeatable combination. Rainbow has been called the winningest small pony in American Horse Show Association and United States Equestrian Federation history. In 2009, she was inducted into the Upperville Colt and Horse Show’s Wall of Fame, and her official retirement ceremony was held at the Pennsylvania National Horse Show. Rainbow Too is the “pot of gold” at the end of an astonishing career spanning two decades. Watch for big accomplishments in the show ring with this amazing pony.